Our bankruptcy office in Avondale is comprised of experienced Avondale bankruptcy attorneys and staff. We have lawyers who are ready to assist you in eliminating the overwhelming debt that you and your family may be facing. Our Avondale bankruptcy attorneys will make the process of filing for bankruptcy fast and seamless. When hiring our Arizona bankruptcy team, you can rest assured that you are working with highly experienced, knowledgeable bankruptcy attorneys. We are committed to helping the people of Avondale, Surprise, and Goodyear, Arizona achieve the debt relief that they seek. Keep in mind, our Avondale bankruptcy attorneys have filed hundreds of Arizona bankruptcies and assisted thousands of people with debt relief in Arizona. FREE bankruptcy consults near you in Avondale! We know that you may be having financial problems, otherwise you wouldn’t be investigating bankruptcy. Our Avondale bankruptcy attorneys and staff take the stress and troubles out of the process of filing for chapter 7 or chapter 13 bankruptcy with our FREE consults. At your free consultation we will analyze your financial situation, give you possible solutions to your problem, and will answer any questions you may have. We’re also in a neighborhood near you with offices throughout Arizona. Contact us now, one of our trusted staff is standing by ready to help you. Why choose My Arizona Lawyers? We offer free consultations. You get free, honest legal advice with no obligation. Besides Filing your bankruptcy we offer instant debt relief through filing your case. Another benefit is we guarantee the lowest bk attorney fees. We also have the experience. We have filed hundreds of Arizona bankruptcy cases. Our Avondale Bankruptcy Attorneys offer payment plans for every budget. We also offer Aggressive Representation. We can even sue creditors for harassment, so you get paid. Additionally, we pay great attention to detail with each of our bankruptcy clients. Our staff is empathetic to the situation of our clients. Become debt free! Bankruptcy start to finish in as little as 90 days. Chapter 7 and Chapter 13 Bankruptcy can eliminate debt including credit cards, bank loans, and medical bills. My AZ Lawyers will assess your financial situation and best determine if you qualify for Chapter 7 or Chapter 13 Bankruptcy in Arizona. Our Avondale bankruptcy attorneys will discuss all your options. Residents in Avondale, Arizona contact My AZ Lawyers for their debt relief case, because our firm has a reputation for providing excellent legal representation at an affordable rate. Years of experience and thousands of debt-related cases and qualified attorneys knowledgeable in the Arizona Bankruptcy Law makes our firm the best choice in representing your legal case. Many of our Avondale clients want creditors to stop calling, and to regain control of their life. Even after exploring and exhausting all other options to pay back debt, if it is just too much. An Arizona bankruptcy filing can give you a clean slate, erase date, and stop the phone calls. According to Arizona law, collection actions against you must cease once a Chapter 7 or Chapter 13 bankruptcy has been filed. My AZ Lawyers will act quickly to file your petition, and set the bankruptcy protection in motion. A creditor may not initiate or continue wage garnishments, telephone calls, or continue lawsuits demanding payments. Our Avondale bankruptcy attorneys can file an emergency bankruptcy petition if you are in jeopardy of a home foreclosure or other issue that needs immediate legal attention. Our Avondale Bankruptcy team will work with you to help you retain your assets: you may be able to keep your home, car, and other personal belongings when filing either Chapter 7 or Chapter 13 Bankruptcy in Arizona. Our attorneys are the best Avondale bankruptcy attorneys, because they know the law. Additionally, our Avondale bankruptcy attorneys know the ins and outs of the bankruptcy code, they know the courts, and they know they trustees. My AZ Lawyers will always proceed with your best interests in mind and dedicate their efforts to the best possible outcome for your case. Next, our Avondale Bankruptcy Law firm will help you to understand the steps to take following your bankruptcy discharge. We want you to quickly get back onto the track of financial success. Showing you how to rebuild your credit is one way our team demonstrates our commitment to clients. Our Avondale bankruptcy attorneys serve from the beginning to the end of the bankruptcy legal process. Contact our office to schedule a free debt evaluation with one of our experienced, affordable bankruptcy lawyers in Avondale, AZ. A debt management expert and bankruptcy attorney in our Avondale, Arizona office can help. My AZ Lawyers services all of Maricopa and Pima counties in Arizona. We also service the communities of: Anthem, AZ, Avondale AZ, Goodyear AZ, Prescott AZ, Peoria AZ, Scottsdale AZ, and Surprise AZ. 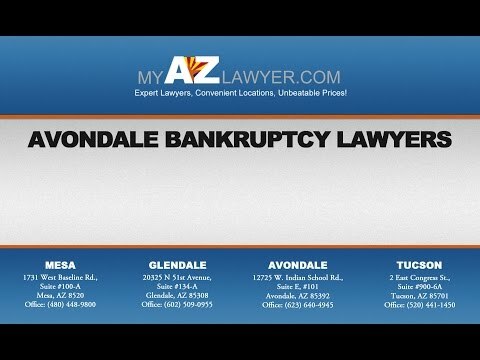 Avondale, Arizona residents trust the experience of My AZ Lawyers to handle their bankruptcy and debt-relief needs. Contact the Avondale bankruptcy attorneys to find out if bankruptcy is your best option to erase debt. Therefore, filing for bankruptcy is not an easy decision to make; there are many considerations that need your attention. The experienced attorneys at our Avondale Bankruptcy Law firm will be able to help you assess your financial situation and get you started on the best method to achieve debt relief. A lawyer knowledgeable in Arizona Bankruptcy Code will be able to provide you with specific options, information, and answers. Therefore, it is up to you to decide if now is the right time to schedule a FREE DEBT EVALUATION. Furthermore, you need to decide if you are ready for a great financial future. If so, contact our office through this website, or call to schedule an in-person on by phone confidential, professional, helpful consultation. OUR AVONDALE BK LAWYERS CAN HELP. Are you an Avondale resident struggling with debt? My AZ Lawyers can help. Whether you are considering Chapter 7 or 13 bankruptcy, our lawyers will help you take charge of your financial future. Hence, our legal professionals are trained to find the best solution for your individual financial situation. Remember: bankruptcy is designed to alleviate financial stress. Therefore, bankruptcy should help you to move forward into a debt-free, burden-free financial future. If you are an Avondale resident in need of legal financial advice and are considering filing for bankruptcy please call My AZ Lawyers at (623) 640-4945. Filing chapter 7 bankruptcy or chapter 13 bankruptcy in Avondale is a perfect debt remedy for anyone facing financial issues in these challenging economic times in Avondale. Debt relief laws offer different avenues that an experienced Avondale bankruptcy attorney can use to help consumers in Avondale. Thus, an attorney at My AZ Lawyers will determine the best solution for your case based on your legal needs and goals. Furthermore, we will explore all legal options: debt consolidation, Chapter 7 bankruptcy, and chapter 13 bankruptcy, or debt negotiation. These are solutions available to most consumers even under the 2005 bankruptcy law revisions. Having an attorney experienced and knowledgeable in the Arizona Bankruptcy Code, Law, and court proceedings and process is your best option for eliminating your debt. Call our Avondale Bankruptcy Law Firm for details on payment plans and financing options so that you can get expert legal representation for an affordable cost. When overwhelming debt, harassing creditor phone calls, and missed opportunities are affecting your life, it is time to contact My AZ Lawyers. We can help. An attorney can provide a FREE DEBT EVALUATION and let you know exactly, what your legal options are to deal with your specific debt. Our team is professional: we don’t judge anyone for their debt. My AZ Lawyers wants to explore options and give you the best course of action to take so that you can have the quality of life you deserve. When life happens, and you find yourself in a situation where debt affects your future, the Avondale bankruptcy lawyers at My AZ Lawyers are ready to assist you by putting debt-relief strategies to work for your case. Take advantage of the opportunity to call an experienced Avondale attorney who will listen to your needs and discuss your concerns. By getting information and options, you are better able to make good decisions regarding your financial future.